I've been writing this post in my head all afternoon, but now it's come time to put fingers to keys (so sad that it's not pen to paper), I still haven't quite formulated it into a coherent ramble. Originally I was going to waffle on about looking through the archive of the past six months in my phone's gallery with Miss A this afternoon, but then I decided on a whim to make bread and that post has a definite subject. You see, a few days ago, Miss A and I stopped for a drink and a snack in a Sainzlebob's cafe. She won't drink milk but thinks babyccino is coffee like mummy's and it's a game I'm happy to play even if it is a slightly expensive way of getting calcium in to her. As she was hungry and had already consumed my stash of grapes and the emergency organic gingerbread man, I helped her to choose a cheese scone (rather than a cupcake or chocolate croissant) believing that I was making an okay choice as a frazzled mother. But then I decided to tweet a picture of the event and got taken by surprise. I received a tweet back about then potential content of Sainsbury's cheese scones and the useful information that they contain an ingredient that can be used to make wallpaper paste. Very true. We have yet to make pasta pictures with flour and water glue, but it's something I did many a time in my childhood. My mother was never concerned that my innards would be glued together. And I've made it to my thirties so she was right. But rather sadly, that one tweet of mine taken out of context sparked a defensive streak in me. Potatoes, vinegar and yeast. Yummy! If I'd been feeding her turkey twizzlers and blue smarties (on the same plate because I'm classy like that) I could have understood a bit more. Or if I'd tweeted a picture of her in McDonalds or sucking on Fruit Shoot like so many other toddlers, I wouldn't have minded so much. But what's so wrong with a cheese scone? Really, deep down it sparked the simmering guilt that this mission of mine to broaden my family's food horizons isn't working as well as I had hoped. Miss A is going through a fussy phase - at one time for weeks she'd only eat pasta with cheese and yogurt and fruit. Slowly but surely, we've moved back to eating bread and meatballs and peas and this week baked beans have been added to the list. But it's been hard work. The number of times I've slaved over making some uber healthy, toddler friendly recipe only to have it tipped onto the floor with a cry of 'pasta Mama' exceeds the number of fingers and toes that I have. Honestly, I try. In fact, Miss A is offered far better food than either the husband or I get. She just refuses to eat it. Back when I first started weaning her, we did baby-led weaning. None of your faffy puree stuff and I made darned sure that she had fresh home-baked bread daily, no chocolate, sweets or cake in her diet. Because I was totally in control of her environment. 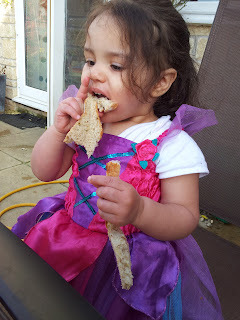 But now, with the influences of the time she goes to nursery, her awareness when we're out and about and interaction with peers plus a strong will means that food battles occur frequently and my standards have slipped somewhat. These days I'm happy that she chooses something savoury rather than me having to deal with the tantrum that ensues when I tell her that no, she can't have chocolate or no, she's had far too much fruit or cheese for one day. And it rankled that someone who doesn't know me and how hard I work both in and out of the home should dare to question my parenting skills. Of course, the comment was well intentioned if misdirected (she admitted that her own nephew's grandmother could do with some lessons in healthy toddler food) and badly timed. But after a lot of sulking, it did guilt me into remembering that now Miss A is back eating bread, I should make more of an effort to try and bake more than once a week. 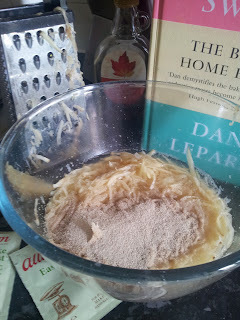 Which is why I chose Dan Lepard's Flash Loaf. He claims that with some ingenuity, you can have a freshly baked loaf, cooled and ready for slicing in just two hours. I would say that's a little wide of the mark because there's the weighing and measuring (10 mins if you include gathering ingredients and equipment); two lots of kneading plus three ten minute rests; shaping and then a 20-30 minute rise and 40-50 minutes in the oven. At the extreme end of those times, you'd take the full two hours to get it onto the cooling rack. 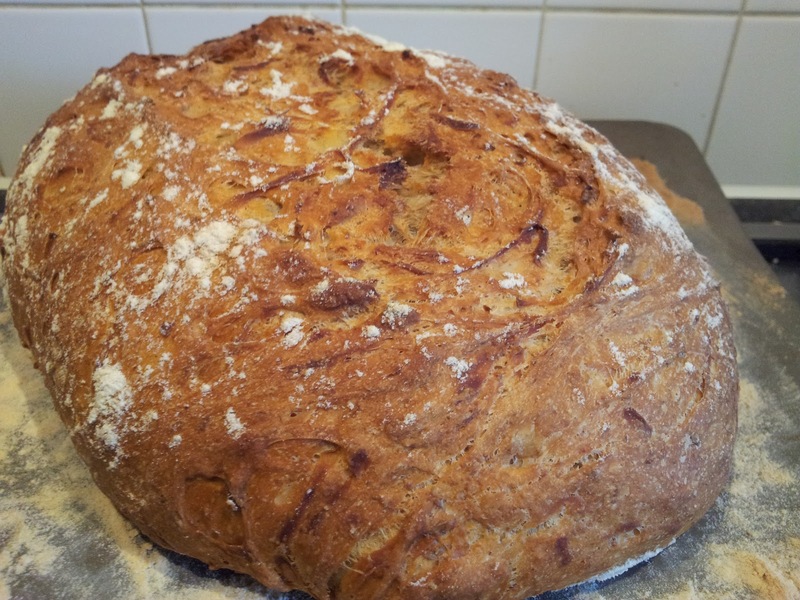 But, from a man whose sourdough takes two weeks to make, this is a fast loaf. The recipe calls for potatoes and vinegar plus five teaspoons of yeast (slightly shy of two 7g sachets) to kick start it in addition to the usual flour, salt and water. There is no specification for the type of potatoes or vinegar to use. If I'm honest, these two ingredients leant the bread a faint aroma of chips once it was cooked - only if you put your knows right up to the loaf mind you, but chips all the same. You can see from the picture that it had a lovely crunchy crust and the insides were beautifully soft and doughy. I found the bottom to be a little damp and so popped it back into the oven for five minutes once I'd turned it off and it was starting to cool down. I don't know if the type of vinegar or choice of potato (I used regular malt and bog standard baking potato respectively) would make any difference to the flavour. They did make a wonderfully textured loaf that you just can't get with my two-hour loaf recipe, but I can't quite get my head around eating this loaf toasted and slathered with jam in the morning. Four fruit marmalade and chips anyone? And for a toddler who hates chips (yes, they do exist, I own one!) Miss A wolfed the bread down like her life depended on it. And as my white flag of truce, I shared a picture of her snorfing the bread down with the lady who rankled my inadequate mummy feelings. Will I make it again? Perhaps. I need to spend some time reading up on the theory section of Short and Sweet to see if there is any advice on best vinegar or potato types. 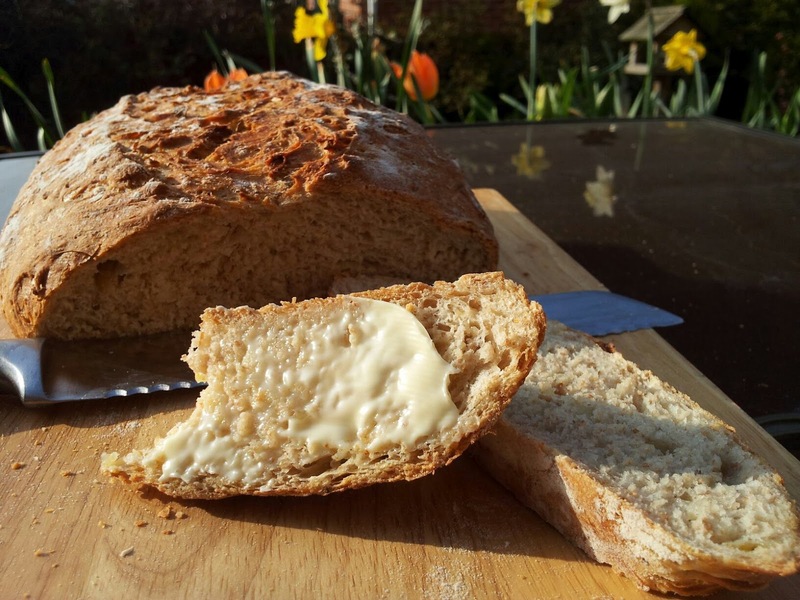 I did really enjoy it but feel that it is best suited to certain dishes or meals such as part of a posh ploughmans or with lots of lovely picnic savouries, whereas my bog standard white loaf is a bit of an all round crowd pleaser in this house. Or I might stick to Dan's own easy white bread recipe which I tried before as part of this challenge. Give it a go and see what you think! The recipe I used is from Short and Sweet, but it's also on the Guardian website. Hey did you weigh 175g of raw potato then peel and grate or should it be 175g if grated potato? I've just given this loaf it's second go and the batch didn't rise and is very dense and moist inside! Any help would be great!